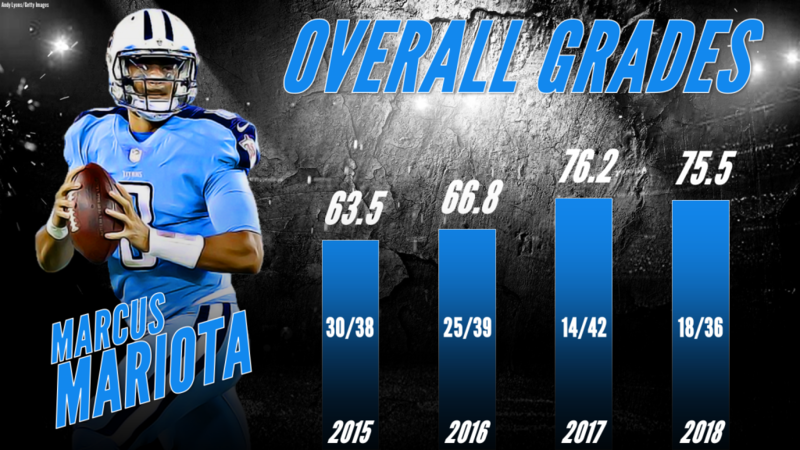 Marcus Mariota is in his fourth season as a pro after his stellar career at Oregon, and although he finished last season graded in the top half of quarterbacks and currently ranks 18th out of 36 players at the position, he was still likely expected to do more as a No. 2 overall pick. With the Tennessee Titans sitting at 6-6 and alive in the playoff race, “Super Mario” will have to level up against a disappointing-but-still-scary Jaguars defense that just shut out Andrew Luck and the Colts. After all, the Titans’ playoff hopes are on the line. One of the most stable ways for measuring quarterbacks is the performance from a clean pocket, and Mariota hasn’t exactly performed at an elite level when kept clean. This season, he has completed 150-of-204 attempts for 1,648 yards, nine touchdowns and five interceptions when kept clean, resulting in a passer rating of 101.5 that ranks 21st out of 36 quarterbacks this season. For perspective, second-year quarterback Nick Mullens ranks 12th (106.5). Mariota is also middle-of-the-pack when it comes to making big-time throws from a clean pocket, as his 4.41 big-time throw percentage from a clean pocket ranks 16th out of 35 quarterbacks with at least 100 such attempts. Some of the guys at the top of the list include Russell Wilson, Drew Brees and Baker Mayfield – guys who have shown that they can consistently make throws in between levels of the defense and into tight coverage. Although performance from a clean pocket is more stable than performance under pressure, the way a quarterback performs under pressure is still noteworthy. And for Mariota, his passer rating of 75.9 when pressured ranks 13th, which is a big step up from his ranking from a clean pocket. Perhaps what’s most impressive is that Mariota has an adjusted completion percentage of 70.0% when pressured, ranking eighth; that’s above guys like Tom Brady and Ben Roethlisberger. What is not good, however, is that Mariota hasn’t done well at avoiding sacks when pressured, which is especially concerning since he’s one of the most mobile quarterbacks in the league. Mariota has been sacked on 30.4% of his pressured dropbacks, which is the highest rate in the NFL. Although Mariota’s passing can be unreliable at times, one thing that has stuck with him since his college days is his running ability, and his rushing grade of 79.8 ranks third among quarterbacks. He has forced 19 missed tackles on rush attempts, which is the most among signal-callers, and his 7.04 yards after contact per attempt ranks fourth. Mariota is still very effective on zone reads; he has kept the ball on zone reads 12 times this season and ran for 70 yards (5.8 average), which ranks higher than Lamar Jackson (5.7) and Cam Newton (4.4). With numbers like that, maybe the Titans should use the zone read more, especially since Jackson and Newton have run it twice as often as Mariota. Mariota hasn’t exactly become the elite quarterback that a No. 2 overall pick should eventually become, but he has some positives to his game and still has all the tools to become great. Tonight will probably be his biggest test of the season, as the Jaguars’ defense seems to have come alive after last week’s shutout of the Colts. The last time these two teams met was in Week 3 when Mariota ran seven times for 51 yards and forced five missed tackles. If he can hurt their defense more when given a clean pocket and continue to utilize his mobility, he can take his game to the next level and take the Titans along with him.